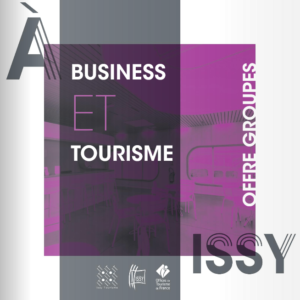 Issy-les-Moulineaux, an innovative territory for your business events! In close proximity to Paris Expo Porte de Versailles, 20 minutes from Montparnasse station by underground and less than 30 minutes from la Défense by tram, discover the town of Issy-les-Moulineaux, the multi-facetted Smart City destination! You will be surprised by the discovery of the French Museum of Playing cards, or by the Saint-Sulpice Seminary, and former home of Marguerite de Valois, wife of Henri IV, better known under the name of Queen Margot, and of course the eco-neighbourhoods and the park of Saint-Germain Island. Issy-les-Moulineaux is a dynamic and attractive town, and has fully equipped, suitable sites for the organisation of business meetings and company seminars. From the cellars in the old chalk quarries to the « alternative » visits, the town of Issy will surprise you by its unique range of activities which will help your company strengthen its team spirit, enjoy afterwork parties or organize your incentive programmes: whatever it is you are looking for, a professional consultant from the Tourist Office is there to advise and assist. He is your unique contact to organise the planning, management and coordination of your project and will offer you complete personalised programmes and solutions which will guarantee the success of your events. Welcoming you to our region of Issy-les-Moulineaux is all about listening, audacity and professionalism.